Hello ... Hello ... my old friends ... It's great to see you once again! Drawn To The Beat is an exhibition of pencil, ink and watercolour drawings by Wolverhampton based artist and musician Alex Vann that Yours Truly KJS stumbled upon earlier today whilst partaking of Sunday lunch in nearby Shifnal with Pete Reynolds, an old friend of mine. The exhibition runs from Sunday 1st March to Thursday 30th April at The Plough Inn, Shifnal in Shropshire and will feature many of Alex's original drawings and paintings. Alex will also be performing a live acoustic set at the formal launch event at 7:00PM on Tuesday 3rd March. 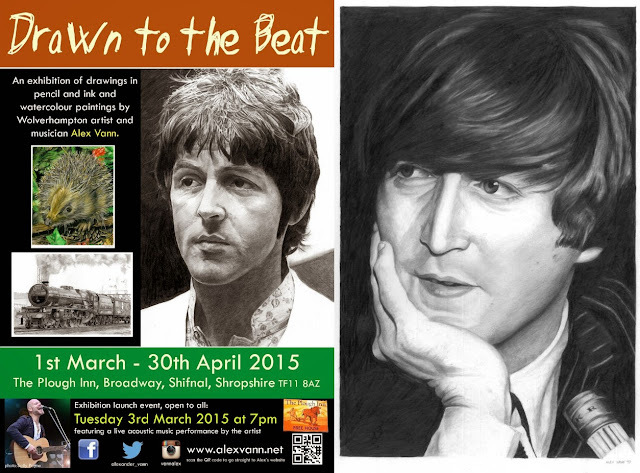 ELO Beatles Forever [ELOBF] recommends the Drawn To The Beat Exhibition by Alex Vann to those enlightened folks who enjoy the music of ELO, Jeff Lynne, Roy Wood, The Move, The Idle Race, 'Brum Beat', The Beatles and related artistes.